Note: The intent of publishing this article is not to promote or diminish/marginalise any specific musical work or genre. MAV is publishing this research article in order to present our research findings in music and to encourage further investigation into this field of gaining positive vibrations from music. Music can affect us at the physical, psychological and the spiritual levels. Physical and psychological impacts of music such as changing our heart rate or our mood are more well known, but the spiritual impacts are not known to the majority of people. The reason for this spiritual impact is because everything consists of the three subtle basic components of Sattva, Raja and Tama. The three subtle basic components of Sattva, Raja and Tama are the most fundamental fabric of creation. Unknown to modern sciences, they permeate through all living and non-living, tangible and intangible things. Music too is made up of Sattva, Raja and Tama. Some types of music and dance are more sāttvik and some are more rājasik and tamāsik. One’s choices in music and dance can increase Sattva or Raja–Tama in one’s life and in the environment thereby affecting one’s spiritual progress. It follows that if one listens to music that is higher in one of the components, it is likely to increase that component in us. 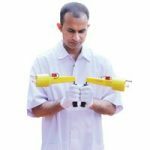 At the Spiritual Research Centre and Ashram, many experiments on music and dance and its effects on a person’s consciousness have been conducted. Here is one such experiment. Using a Universal Thermo Scanner (UTS), the Maharshi University of Spirituality conducted an experiment to find out how different types of music affect one’s consciousness. More information about the setup of the experiment is provided below. One individual took part in the experiment. A baseline reading was taken of the subject using the UT scanner before the experiment. The seeker listened to the first clip for 5 minutes and thereafter a reading was taken of him with the UT scanner. Then the seeker left alone for 20 minutes before listening to the next track. This was so that the subject’s aura would return to the original baseline reading before commencing listening to the next track. 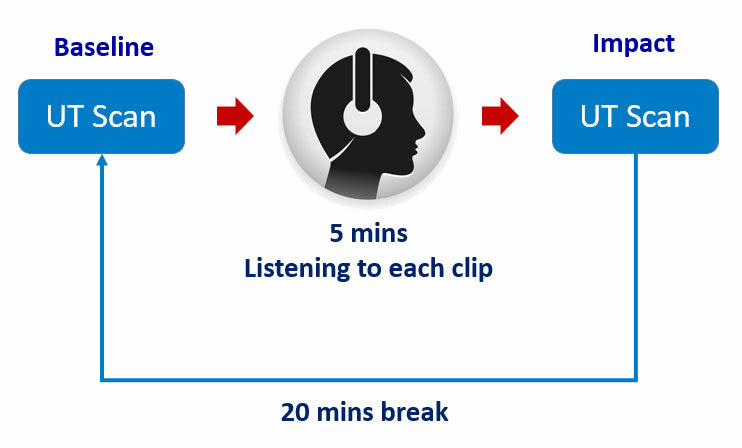 Similarly, the seeker listened to the second, third and fourth clips for 5 minutes each with a 20-minute break in between listening to each clip. A reading was taken of the subject using the UT scanner before (baseline reading) and right after (impact) listening to each clip. The UTS instrument allows one to measure four types of energies emitted by a subject: infrared, ultra-violet, positive and total measured aura. Infrared and ultra-violet readings are considered as reading of a negative nature by the scanner. The readings obtained after listening to each of the four clips are listed below for all the four types of energies. 1. Only if both the arms of the scanner open out to a full 180 degrees can the distance of the aura of that aspect be measured. If the arms of the scanner open to less than 180 degrees, then it means that there is no aura in relation to that aspect. Observations of the subtle effects of listening to each type of music are listed below. Negative energy around the subject increased after he listened to heavy metal music. This is indicated by both the infrared and the ultraviolet energy increasing in the subject after listening to the clip. The subject also developed a negative aura in the IR parameter to the extent of 0.88m. The Total Measured Aura contracted after the subject listened to heavy metal, which is a negative sign. It appears that the spiritual impact of listening to the relaxing music was minimal. This is indicated by there not being much change in the IR/UV, Positive Energy or Total Measured Aura parameters. There was no negative energy detected before or after the subject listened to Indian classical music. Positive energy increased around the subject after he listened to Indian classical music. The subject developed a positive aura to the extent of 0.40m. The Total Measured Aura increased around the subject by 0.5m after listening to Indian classical music, which is a positive sign. There was no negative energy detected before or after the subject listened to a song sung by a Saint. Positive energy increased around the subject after he listened to the music track. The subject developed a positive aura to the extent of 1.80m. Though a positive aura was also generated around the subject after he listened to Indian classical music (0.4m), the radius of the aura was significantly greater (1.8m) after listening to the song sung by a Saint. 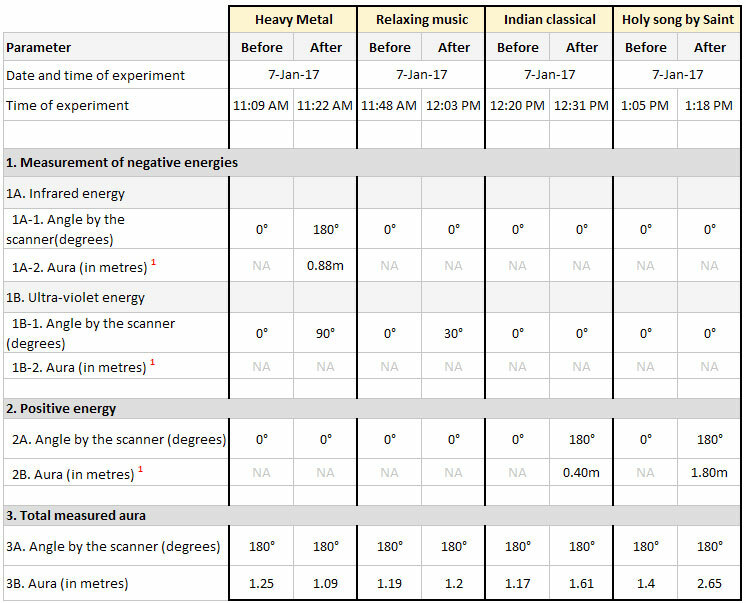 Similarly, the increase in the ‘Total Measured Aura’ was significantly greater (almost double) after listening to a song sung by a Saint as compared to the increase (40%) after listening to Indian classical music. This was even though the baseline reading taken before listening to the Holy song was the highest amongst all the tracks. Based on the observations, listening to heavy metal had a spiritually harmful effect. Incidentally, in a separate study, lab rats who listened to a music track from the same band showed impaired learning ability and they turned aggressive and cannibalistic (Wertz, 1998) as compared to a control group. The impact of listening to the clip of relaxing music was spiritually neutral. Interestingly, scientists have recently stated that this clip is the most relaxing piece of music ever (Forbes, 2016), so relaxation does not necessarily equate to spiritual benefit. The artist singing the clip of Indian classical music is Pandit Bhimsen Joshi, who is one of the most celebrated artists in Indian classical music. Listening to this music did have a spiritually positive effect on the subject. More research needs to be done to determine if this positive effect was due to the extensive training of the artist, due to the genre of the music, vocals, instruments or a combination of these factors. The subject benefited the most spiritually by listening to the song sung by a Saint. The benefit was far greater than that from listening to the clip of Indian classical music. This was despite the fact that the Saint had not received any formal training. Generally, an artist with more training is held in higher esteem, but this experiment indicates that conventional musical training may not the main factor in determining the spiritual positivity of the music sung. Based on many experiments conducted in relation to music, the following are some of the key observations noted by the spiritual research team as it continues to research this aspect. Music has the ability to affect a person at the subtle-level. The type of music one listens to determines whether the effect is positive or negative. Music and sound can obstruct or enhance spiritual growth. Music that generates relaxation at a physiological level does not necessarily translate into spiritual benefit. Mainstream research on music and dance often focuses on productivity, reducing anxiety, etc., as opposed to any spiritual benefit. These findings can therefore potentially open up a whole new area of research into the spiritual aspects of music and dance hitherto largely untouched by modern research. We appeal to scientists/researchers interested in carrying out further research into the spiritual effects of music to contact us using our contact form.